This weekend our family enjoyed our first beach trip of the summer! One of my favorite memories of my trips as a child is building sand castles together at the beach. It's a tradition I want to keep going with our family because it's such a fun time to connect and be in the moment. 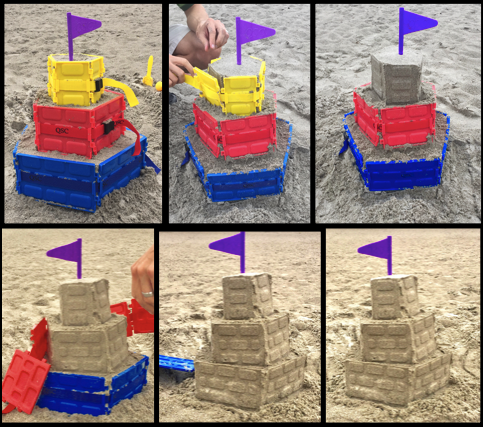 A few weeks ago I came across Quick Sand Castle, a sand castle building kit that looked pretty awesome, so I reached out to the company to see if we could give it a try and share our thoughts with you. With two new kits in hand, we made our way to the beach to see what we could do with them. Turns out, we could do a lot! First, let me just say, the adults may have had more fun with these kits than the kids did...and the kids loved them. When I saw all of the pieces that come in the kit, I was a bit nervous that we had gotten ourselves into a complicated activity, but that wasn't the case at all. For the most part, this was a really easy kit to use. 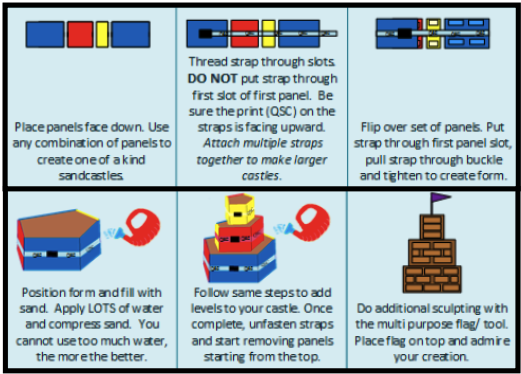 We found that threading the belts through the plastic bricks was a little tough for younger kids, so we recommend letting them pick out the brick molds they want to use and threading the bricks for them. Once the brick chain was ready to go, my husband set each ring up one at a time and the kids filled them with sand. Everyone was able to pitch in filling sand and pouring water to pack the sand castle layers tightly. You'll want to fill each ring with lots of wet sand and be sure to compress it down well. Once complete, we loosened the straps and removed the panels outward. If you have older kids, they may be able to unlock the belt and take the bricks away themselves. Little ones may benefit from Mom or Dad doing it for them. We stacked and filled all of our rings before removing any of the belts. This keeps the castle stable while you build. The mini shovel, rake and watering can are the perfect size for kids and super helpful accessories for building. We were pretty impressed with how strong and detailed our castles turned out. The kit is really easy to use and the kids were so proud that they built something so impressive. It even attracted some attention from other families on the beach. The flag included in the kit is an adorable topper to their creation. Overall, we had a blast with these sets and would recommend them to others. They'd make a great summer gift for kids! Keep the sand wet, so that the castle sticks together and holds its shape. Pack the sand in well, so that the bricks/belt push outward as much as possible. Build your sand castle closer to the ocean. Kids won't have to travel far to fill up the watering cans. Another cool thing about these kits is that you can combine them to create larger, more intricate sand castles. The belts are long enough to accommodate quite a few bricks and the additional set allows you to mix and match different size panels. Two sets is also great for big groups and dueling sand castle competitions! 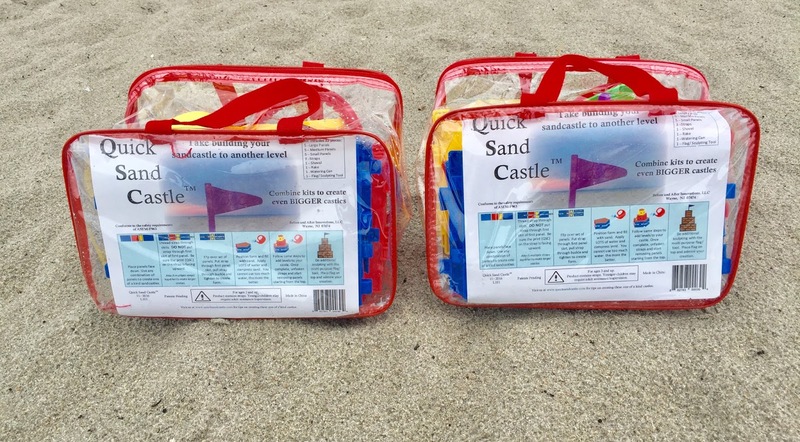 The Quick Sand Castle kits are available directly through the QSC website here. They offer free shipping, which we are a big fan of. Disclaimer: The products in this post were provided for free by Quick Sand Castles. As always, our posts are our own, honest opinions.